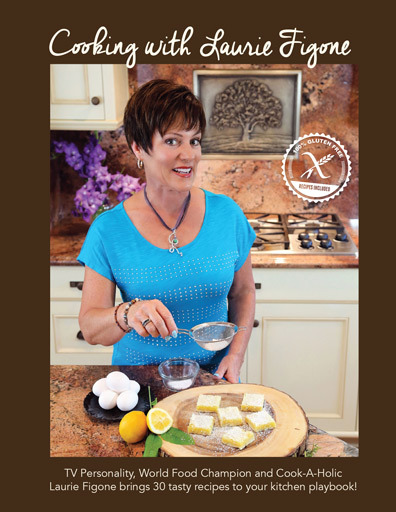 Award-winning chef and TV personality Laurie Figone is proud to present her first cookbook COOKING WITH LAURIE FIGONE (only $25). This full-color cookbook, inspired by Laurie’s friends and family, has 30 easy, delicious, and healthy recipes ranging from appetizers and main dishes to sauces and desserts, many of which do not feature salt and are gluten free. This book features recipes that are simple, healthy, and delicious. They are also economical and practical, with ready available ingredients, and minimal cleanup. Each page has a section for notes to keep track of changes one might make to personalize each recipe. The book has a spiral binding so it will lay flat and stay open to the page one is using, making it very user friendly to read the recipes while cooking. The book also has a special augmented reality feature. By downloading the free app “Aurasma”, the user will be able to view videos that appear as though they are playing on the pages of the book by simply pointing their phone or tablet camera at the recipe photos. The videos are of Chef Figone explaining her recipes and giving helpful tips that are not mentioned in the book. What you will find in this fantastic book is a glimpse of the culinary art she has been able to create due to absolute, unmistakable, unwavering passion. There is little wonder why she ascended through the ranks of hundreds of talented cooks to become our 2014 World Dessert Champion. Laurie Figone’s bubbly personality and love of great food comes shining through in her first cookbook. I love her take on a BLT Salad and her Apricot-Almond Upside Down Cake is sure to be a new staple in my house. If you like fresh ingredients and a fun spin on recipes, this book is for you! Laurie is one of the most enthusiastic and fearless cooks that I know. She has a great sense of taste and presentation as these recipes confirm!